In order for businesses to begin their ‘World Class Manufacturing and Services’ (WCMS) journey companies need to identify their current position benchmarked against local and international standards. Audits are used to identify ‘quick wins’ and focus improvement areas. Cost of Non-Conformance (CONC) audits quantify areas of non-conformance by department and using the Parato principle indicates corrective actions required for the greatest improvement and most immediate reduction in waste. TPM readiness survey focuses on TPM specific areas and prioritises the type of activities required during a TPM intervention. This forms part of the planning phase of the process and is repeated at various points during the full intervention. 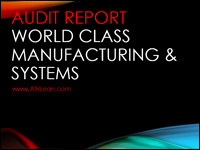 Plant Maintenance Audit is used to create a benchmark for organisations wanting to compete at international levels of manufacturing competitiveness.